One of the most unsettling tales to emerge from early Hollywood is the story of Roscoe “Fatty” Arbuckle, the silent film star who first made his major work in Edendale, the movie-making hub that encompassed part of present-day Echo Park. Arbuckle’s career came to an abrupt end after he was implicated in the death of aspiring actress Virginia Rappe in 1921. 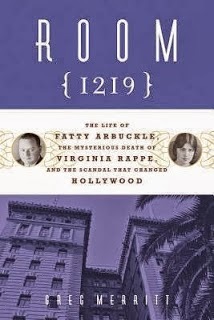 That story is the subject of Room 1219: The Life of Fatty Arbuckle, the Mysterious Death of Virginia Rappe and the Scandal That Changed Hollywood, published earlier this year. Author Greg Merritt revisits the circumstances that led to the meeting of Arbuckle and Rappe in a San Francisco hotel on a Labor Day weekend and tries to learn just what happened. Merritt shows us the business of early Hollywood while retracing the lives of Rappe and Arbuckle. Although he inaccurately puts Keystone Studios in present-day Silver Lake instead of Echo Park, Merritt gives a fine overview of Arbuckle’s days in Edendale — first at Selig Polyscope, then under director Mack Sennett at Keystone — before he moved on to the big time with Paramount Pictures. Room 1219 introduces us to others in Arbuckle’s orbit: Arbuckle’s wife, the silent movie actress Minta Durfee; Arbuckle’s nephew, the silent film performer Al St. John; and rising star Buster Keaton, who started his movie career in Arbuckle comendies and became one of Arbuckle’s most ardent defenders. Those stories are interwoven with the drama that plays out in San Francisco: a horrific death after an impromptu party; a prosecutor’s decision to file murder charges; the newspapers that had a feeding frenzy over the case — and reached a verdict long before a jury; the sudden ban on screenings of Arbuckle’s movies. Room 1219 can be ordered from such book sellers as Stories Books & Cafe in Echo Park and Skylight Books in Los Feliz, as well as online company Amazon. To get a taste of Merritt’s work, here’s a fine Q and A from the the classic film blog Out of the Past. Colonel Griffith’s Observatory Become a member of the Echo Park Historical Society!